The sensitive issues on the vow of celibacy of the Catholic priests had been escalating into a national scandal as three priest with children celebrated Mass despite two them with revoked license in hopes to reach for Pope Francis. 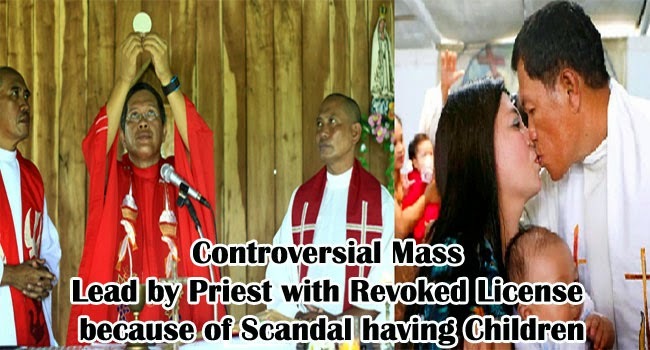 According to GMA news, perceiving the current Pope as openminded, the three priests, Jesus Siva, 54; Hecto Canto, 53 and Jose Elmer Cajilig, 52, had moved the scheduled Mass from December of 2014 to January 11 to coincide with the coming of the Pope to the country. The three priests appealed for the vow of celibacy to be made optional. Arguing that it was not Biblically based and the gift of celibacy which mean being single for the rest of one’s life to serve the Lord is not a gift given to all priests. The three father priests also asked for their children to be given the right to be baptized as it meant dignity to their kids. Siva has two sons in their teens and shared that the children of the priests are suffering from the stigma which they do not deserve because of the celibacy rule in the Catholic Church. Canto and Cajilig had their children baptized despite the controversy. Cantor and Cajilig even wore their vestments as Siva led the Mass. The mass held in Our Lady of Perpetual Help Chapel was attended by family, friends and parishioners. One of Canto’s children even served as one of the altar boy in the mass. Despite the controversy and open objections, Cantor married Cynthia Diamante on May of 1998. In June, 1999, Cantor and Cajilig’s licenses to officiate marriages had been revoked by Church Officials but it was restored by NSO last year. The three priests are still not losing hope as the date of the Pope’s visit nears.